Acid attack incidents in India have stunned our conscience repeatedly with maimed countenances, shocked survivors and families driven to insolvency supporting the recovery costs of victims. It is the worst infliction on a human being, leading to complete debilitation, loss of income and opportunity and also social alienation. Acid attack survivors endure immense trauma and are unable to lead a normal life ever again-often blinded, scarred beyond recognition and robbed of their identity. Acid attack cases are increasing every year. Formally reported cases have increased from 85 in 2012 to 140 in 2015, while it is believed that there are many which are not reported. The victims mostly have been women between the ages of 14 and 35, and attacks often occur as revenge for rejecting a marriage proposal or sexual advances, for not bringing enough dowry, for bearing a female child, for not cooking a good enough meal, etc. Since 2013, Care Today Fund has been supporting Ms Tuba Tabassum, an acid attack survivor from Siwan in Bihar for her medical treatment and education. She is presently undergoing coaching from a renowned institute to appear for the medical entrance examination, supported by the Care Today Fund. We acknowledge that, like Tuba, there are hundreds of acid attack survivors in the country hoping for sustainable solutions to their endless suffering. Care Today appeals for your involvement to take forward the fight against acid attacks and to support survivors. You could do this by donating to the fund set up exclusively to support survivors of acid attacks. 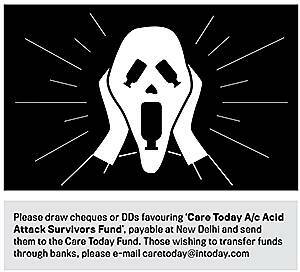 To donate, please send your cheque or demand draft drawn in favour of 'CARE TODAY A/c ACID ATTACK SURVIVORS FUND' and send it to the address mentioned in this appeal. Your donations will help us support acid attack survivors for their medical treatment, education and rehabilitation, including life-skill training and providing sustainable livelihood opportunities. Your donations will be eligible for income tax deductions as per the provisions of 80G of the Income Tax Act. Names of donors who contribute Rs 5,000 or more will be carried in the pages of india today magazine. We do not accept cash or money orders.